I don't focus on buying going-out pieces often, but when I do, I always invest in styles I know I'll wear on more than one occasion. 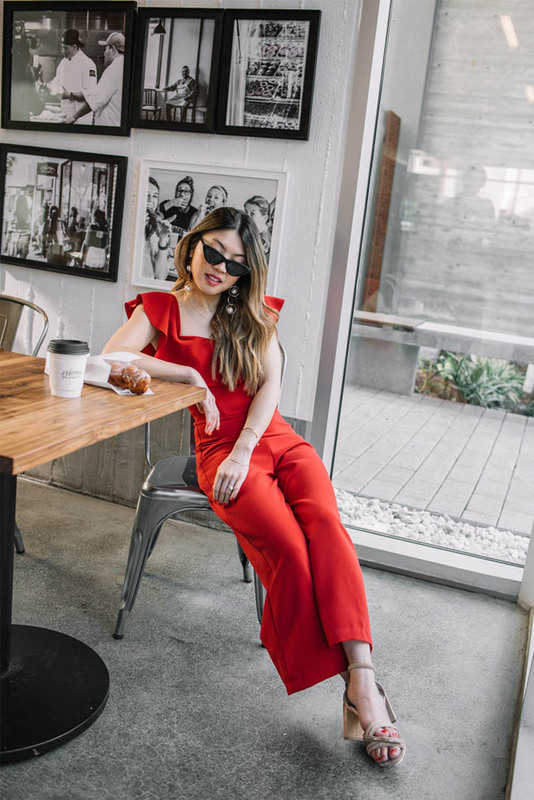 This red jumpsuit, I wore (back in December) to a holiday party works so good for many events. For a Vday date, Chinese New Year, girls night out, and even a spring/summer wedding, it's such a fun, dressy meets casual piece. Chong, my husband also loves the color red, so it's nice to get fancy, surprise your guy and keep that fire burning from time to time. If red isn't your color, we all know how a black dress always works its magic. The way to make it feel new again is updating with gorgeous details such as lace like Carlina did here. This one is just so pretty and a great go-to that's versatile. I might have to borrow it from her one day :). This fun little shoot we did at Johnny Doughnuts just made me realize my closet is in need for a few trusty after-hours pieces. If you guys have recs, I'd love to know!